LINE UP! : Every morning, concertgoers line up to place their chairs at the main stage, reserving their spot for the day’s music line-up. BE A PART OF THE COMMUNITY : Upwards of 5,000 people attend Live Oak Music Festival, creating a little city in a dusty campground off Hwy. 154. The light filters through oaks leaves, dancing along the dusty path to Live Oak’s main stage. There’s just a whisper of a breeze as campers queue up for the early morning Acorn Roll, beach chairs in tow. This is how the mornings start at the Live Oak Music Festival, with people lining up to place their chairs in rows, only to depart and return later when the music starts at 10 a.m. The early birds get front-row seats, and you can tell the sleepyheads by their distance from the stage. Of course, in the spirit of community, you can sit in any chair you want … until the owner comes to claim his or her spot. This is the Live Oak way. In about a month, Live Oak Camp—a short, 90-minute drive south, just off San Marcos Pass—will transform from a sleepy, oak-shrouded campground into a mini city replete with a “downtown core,” multiple venues, eating establishments, shops, and layer after layer of “suburbs”—little communities radiating out in circles where like-minded music lovers find fellowship and fun. Some groups have been camping together for decades, their camps well known. Others are clusters of newbies, experiencing Live Oak for the first time. It doesn’t matter if it’s your first time or your 15th, the feeling of inclusion, of being part of something bigger than yourself, permeates the air. You can literally breathe in the good vibes. Kids run around unfettered, squealing with delight. Musicians wander from camp to camp for impromptu jams. Everyone else shuffles along with dusty feet and wide grins, catching acts at the various stages, grabbing a bite to eat at the myriad vendors, shopping, talking, hiking, or lounging. It’s a stress-free love fest that seems to spontaneously rise out of the dirt, but it’s not magic: It’s 800 volunteers transforming this dusty 40-acre campsite into a town, population 5,000. Without KCBX, there would be no Live Oak Music Festival. Our local public radio station has always been a nexus for music lovers. Most of the DJs are volunteers, so it was natural that out of a shared love of music would come a music festival run by volunteers. The first festival was a one-day affair held at Biddle Park back in 1989. Duane, who owned the Dark Room at the time, deejayed the KCBX bluegrass show. Cal Poly professor Jim Mueller did the Old-Time show, Haila Hafley-Kluver did the folk show, and Chris O’Connell—whom Duane credits with coming up with the idea—did the jazz show. THE DANCE OF LIFE : Entertainment starts early in the morning and goes through till night, with an eclectic selection of performers. KIDS RULE! 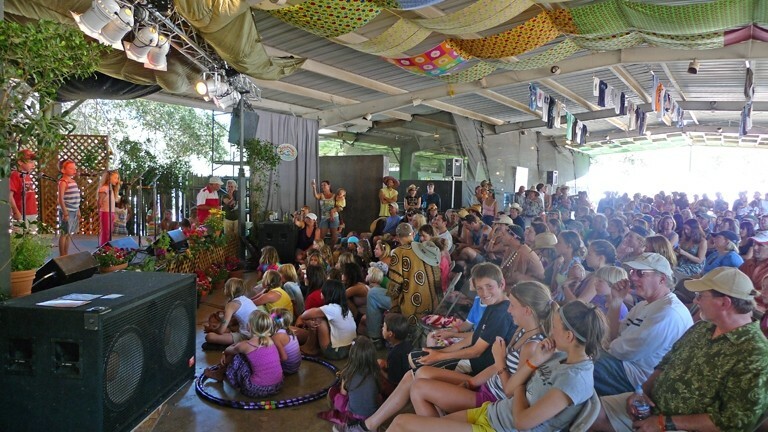 : The Live Oak Music Festival is a children’s paradise, with 40 acres of campsite to explore and tons of kids’ activities. The festival was meant to be a SLO County thing, but it wasn’t long after its genesis that it was forced to relocate to Santa Barbara. 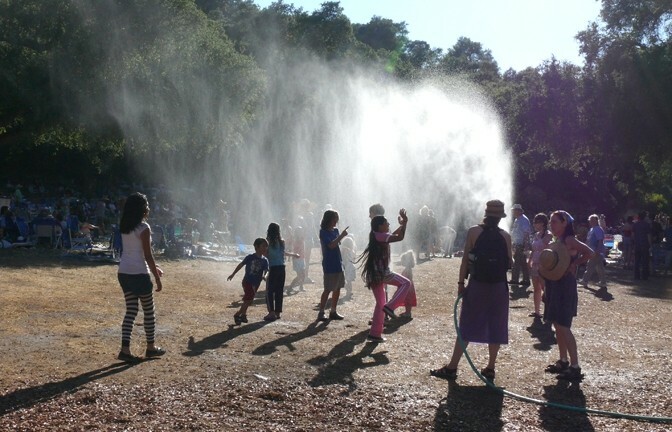 As much fun as Live Oak is for adults, it’s downright magical for kids. It sounds cliché, but it does take a village, and the Little Acorns, as they’re known, are well cared for by the Live Oak community. They’re perfectly safe riding bikes around the campground, but there’s no shortage of stuff for them to do. Shevon Sullivan, who owns Anam Cre’ Pottery Studio in The Creamery, runs the children’s programs. This year rocket scientist Aurora Lipper will be there to do a cosmology workshop complete with Saturday evening telescope stargazing. There’ll be an electricity and robot lab, crafts, climbing walls, music for kids, and storytelling, and juggling unicycle master Mark Wilder will astound with his gravity-defying feats and high-energy performance as he rides his 6-foot-tall “giraffe” unicycle while juggling flaming torches! Holy guacamole, Batman! 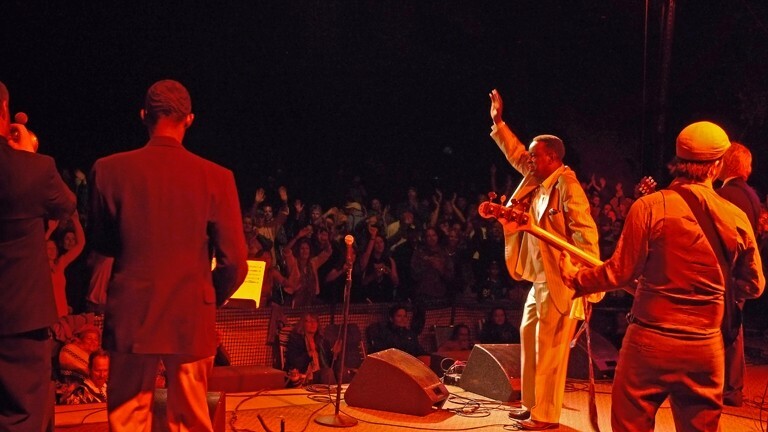 R&B HERO : Charles Walker and the Dynamites fire up the crowd at last year’s Live Oak. JUMP ON THE LIVE OAK BANDWAGON: Never been to Live Oak? Never fear! It’s easy to slip into the spirit of this homegrown music festival, which takes place Friday, June 17 through Sunday, June 19. This year’s line-up features acts such as legendary R&B and gospel singer Mavis Staples, Juno Award-winning folk act The Wailin’ Jennys, funky jazz icon Will Bernard, Tex-Mex super group The Texas Tornados, boogie-woogie hall-of-famer Carl Sonny Leyland, reggae legends Toots and the Maytals, and a ton more! It’s great for families (but no dogs allowed—damn!) or anybody who loves music, camping, and community. Visit liveoakfest.org for a complete entertainment line-up and to buy full festival passes or day passes. 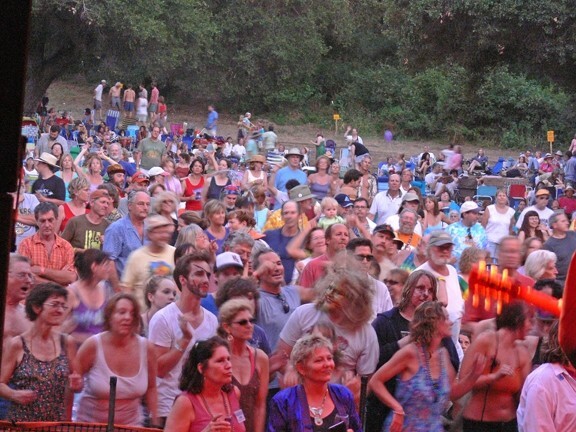 The Live Oak Music Festival is a benefit for KCBX Public Radio. Shevon runs a crew of 50 to 60 volunteers and sees about 500 kids a day. 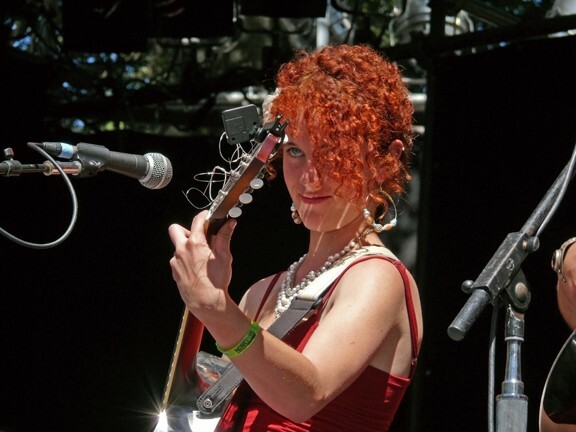 THE LITTLE ACORN WHO BECAME THE MIGHTY OAK: Molly Reeves of the Red Skunk Jipzee Swing Band was a Live Oak kid who grew up to play the main stage last year. SO. DARN. CUTE. : One of the highlights of the festival is the kids’ talent show. I camp with a group of Mardi Gras revelers and regular Live Oak volunteers who call their community Camp Ba’ar Nekkid, in part because of their penchant for clandestine co-ed shower sessions and in part because Allen Root likes to walk around camp late at night in the all together. (Some things you can’t un-see!) Our camp has couches, a chandelier hanging from a tree, an impressive outdoor kitchen, a wine-tasting event, and 30 of the most awesome people you’d ever want to spend a music-filled weekend with. That’s why waking up Monday morning after the festival has ended is always bittersweet. The light still filters through the oak leaves, but nobody’s shuffling off to the Acorn Roll, there’s no early morning Hot Licks performance, just 40 acres of tired but happy campers who’ve once again been dusted by Live Oak magic, and as we pack, we’re already thinking about how much fun it will be again next year.